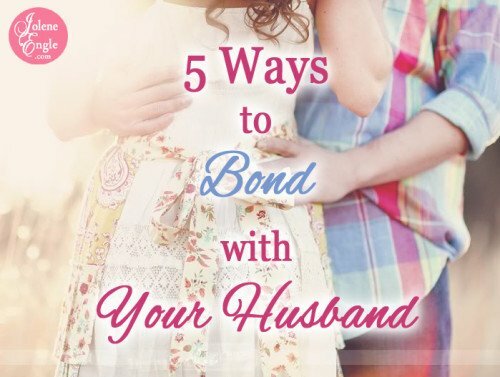 5 Ways to Bond with Your Husband…& a Link-Up! “Come be my friend,” were the words my Beloved said to me. I was a little puzzled by what he meant by that, after all, he was working in the garage and well, I wasn’t. As newlyweds I loved spending time with my husband but what on earth would I be doing as his friend, in the garage? “Just sit out here and talk with me while I work on things,” he said. Well, I thought, that’s easy enough. It’s not like he was asking me to change the oil in his car. So I dragged my chair out and plopped myself in the driveway and there I sat as the two of us conversed. Sometimes we just chatted about the small stuff and other times we got into theological conversations or planned for our future. And sometimes I just sat there reading a book while he was cutting or welding metal. It didn’t really matter what the two of us were doing because it was my presence that he enjoyed. 15 years of marriage and 2 kids later…. Now I’m going to give you ways to help you connect with your man! Is there a hobby or an activity that the two of you can do together? Before my husband and I had children we would go for runs together. When the babies came we continued to do this by adding the baby to a jogging stroller. As our family grew, so did our strollers. (And yes, the runs became much harder and shorter! And sometimes we just went for a walk! 🙂 ) To this day both of us know that if either one of says, “Want to go for a run”, we’re seeking each other’s companionship. 2. Be interested in what he’s interested in. Tonight I just returned from a weekend business conference with my husband. My man wanted me by his side and I wanted to be with him even though the topics discussed this weekend weren’t geared towards my interests. But in spite of not being fully thrilled with what was covered at the conference, what did thrill me was being with my husband, therefore I was happy to go. So, follow your husband’s lead when it comes to his interests. A man typically isn’t drawn to a woman’s interests. For example, how many men would you find at a scrapbook party? Not too many! If he’s interested in golf, try golfing with him. If he’s interested in shooting, go to a shooting range with him. Sporting events? Give it a try. Move towards his interests first and then it’ll be easier for him to engage with you. My husband has many interests ranging from rock climbing, to playing volleyball, to welding. I’ve tried many of them and we’ve settled on a few where the two of us can be equally yoked. Since I sat in on the conference this weekend I was able to be a part of my husband’s world. I could ask him questions regarding what he was learning because I was learning about it too. Whether you can attend a conference with your husband or not, you can still learn about his world. Ask about his day when he comes home and be prepared to fully listen and engage with him. If you’ve got young children, you’ll need to train them to not interrupt while you and their father spend time talking with each other. When my boys were young lads I was extremely intentional about training them to do something else and not to interrupt us while my husband and I had this time set aside each day. This time is designed solely for the two of you to reconnect. 4. Make sure you have interests outside of your children. Many parents make the mistake in having their world revolve around the life of their kids. The couple’s ‘thing’ to do together is to hang out with their children all the time. Here’s the danger in this… at some point in their lives their kids will leave the nest, leaving the husband and wife to feel disconnected from one another. As our kids become adults, their lives won’t revolve around us, nor should it! If they marry someday they are to leave their family and cleave to their spouse. Now it’s your turn. What other things can you do to bond with your man? That’s an excellent one, Tracy! Thanks for sharing it. I loved your post. So true but often forgotten as the family grows!! I used to go with my husband before we had children when he scuba dived. I even took the class. As we ended up having 7 children, those things can easily fall by the wayside. At least you (me) can work extremely hard to get it all back. Thanks for the linkup today, Jolene. Have a wonderfully blessed day!! Judith, you are so right about when the babies come and how hard it is to stay connected to your man. If even the years have gone by, a wife can still reconnect with her man. Thanks for linking up today! My wife is a sweetheart and does many of the things you suggest. I especially love it when she works along side me in the yard and I enjoy helping her in the kitchen, with the laundry, and making the bed. It’s not only a good way to spend time together while getting something done it really leads to great memories and, as you pointed out, brings you closer together. Thanks for the suggestions and for hosting the link up! Thanks for sharing this, Tyson. Yes, the little things a couple does together will build connectedness and memories. Hi Jolene – Yep, I totally agree! We too love to just talk while the other is working. Sometimes while I’m having a bath, he’ll ask if he can join me. Not to have a “steamy” time, but just a friend to talk with while I’m unwinding from a stressful day. The bath idea is precious! Whatever it takes to build the relationship!! Since I began following your blog I read all your post. With your advice, I started hanging out with my husband. We have a great time together. In the past we would go our separate way running errands and such. He actually did not believe me when I told him I wanted to go with him to the lawnmower repair shop. He asked, “why”? I told him it’s a great way to spend times together. It took several more times for him to actually accept and believe that I wanted to hang out WITH HIM. Now we are intentional in being together. I now purposely let him know what I’m going to work on or go on an errand; next thing I know he is going with me or working with me on a project. IT’S MARVELOUS! What a fabulous testimony. It blessed my hear and ministered to me greatly! It’s awesome that you are reaping the fruits of your efforts! Oh I so understand the ‘to-do’ list, Nancy! And I hear you about what he loves and what you loathe. I tried rock climbing with my husband when we were first married, and well, that’s definitely not my thing! So I tried other things with him so we could connect. It’s been a long road (and one I had to adjust because of all my health/physical challenges) but it is worth it. Great advice, Jolene! Thanks for the great post & for hosting, & God bless! So often we miss that HUGE ingredient in a recipe for a wonderful and loving marriage: friendship. It’s great that you started off this post with that major piece of the pie. I’m convinced, Jolene, that having a shared interest outside of our family is crucial for keeping the spark and excitement in a marriage. My husband and I are empty nesters, now, and for 6 months after our daughter went away to school, we bumbled around trying to figure out what to do with ourselves. Then we joined a Toastmasters group. Now we’re honing our public speaking skills together and having a blast. It’s only twice a month, but we look forward to going, enjoy preparing, and have something to talk about over dinner. thanks for the tips 🙂 Visiting from Hungry for God . . . Starving for Time and glad I did. I think one of my favorites on this list is number one! Just in the last 6 months or so I’ve realized that not only does my husband prefer me to be around him when he’s working on his own thing, but I like it when he hangs around while I do my thing. It’s something I know I have to work better at, so thanks for the reminder here! Great post! That’s happy marriage 101 right there! “Come be my friend.” So beautiful, so simple, so exactly right! Great piece of advice Jolene… and the lists are excellent too! Looking forward in saying this to my husband when he comes home… it rings in my head… “Come be my friend…” This is awesome! HI Jolene, thanks for your tips. I’m recently married and even though my husband and I do have fun everything seems to be becoming routine, I especially like ‘be interested in what he’s interested in’. I suppose this could be construed as snarky, but why should the wife have to pretend to like the husband’s activities in order to spend time with him, but she shouldn’t expect him to like women’s activities? Seems very one sided. My 10 year marriage is on the verge of ending because I chose not to join my husband in one of interests. He ended up meeting and connecting with someone at Edc. My world collapsed when he told me and it’s all because I was not there for him when he practically begged me to go with him. I now realize how often I do not take interest in the things he enjoys. Thank you for your post, I am hoping and praying that I can rebuild his interest and trust in me by showing him how much he means to me and how I appreciate him.